Story: A child's mysterious ailment. A desperate mother. An eerie, deserted city shrouded in mist, plagued by secrets. The mysteries are only beginning to deepen. When young mother Rose (Radha Mitchell) - desperate to find a cure for her daughter Sharon's bizarre illness - refuses to accept a medical recommendation of psychiatric institutionalization, she flees with Sharon and heads for SILENT HILL, the town that her daughter continuously names in her sleep. Although her husband Christopher (Sean Bean) adamantly opposes, Rose is convinced the mysterious town will hold all the answers. But as her car approaches the deserted city's limits, a mysterious figure appears in the road, forcing Rose to swerve and crash. When she comes to, Sharon is gone, and suddenly Rose - accompanied by a determined police officer (Laurie Holden) from a nearby town - is on a desperate quest in Silent Hill to find her child. It's immediately clear that her destination - left alone since devastating coal fires ravaged Silent Hill - is unlike any place she's ever been: smothered by fog, inhabited by a variety of strange, haunted beings, and periodically overcome by a living Darkness that literally transforms everything it touches. 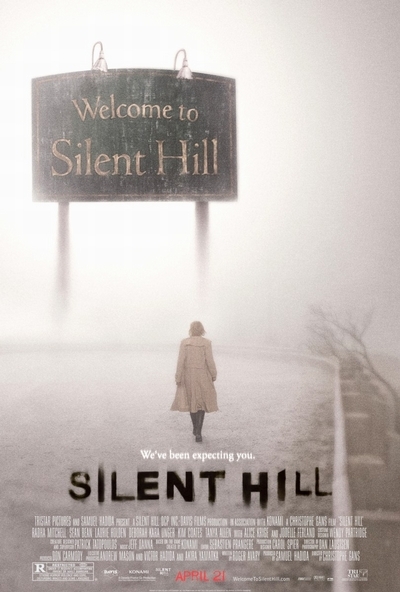 As Rose searches for her daughter, she begins to learn the history of Silent Hill - its violent, puritanical past and the origins of its accursed state - and realizes that her daughter is just part of a larger, more terrifying destiny.